It’s the battle of the new 2018 vans. Always needed for business logistics, the new van is a workhorse with huge space for carrying cargo and modern features for an on-the-go office space. One of the best vans this year is the 2018 Volkswagen Crafter Van. Awarded the best van by judges in “The International Van of the Year Award for 2017”, the new VW Crafter van has a variety of sizes and trim levels to suit your needs. When you’re covering hundreds of miles each week making sure that deliveries are on time, there is no better way for completing this work than in the roomy and comfortable new VW Crafter. Boasting a specially designed ‘ergoComfort’ suspension seat with 20-way seat adjustment to reduce the impact of any jolts you will be taking a great step in the right direction for helping to keep the health of your back at its best. The combination of manual and electric settings allows you to fully adjust your seat to find the perfect position behind the wheel. Volkswagen also goes a step further and adds the option of a heating function for when the weather turns cold, as-well-as a massage function to your driver’s seat. Climb aboard the front cabin space, and the interior is very modern and beautifully laid out with practicality and ease-of-use in mind. In the centre of the dash is a touch screen (Trendline, Highline) that is the same user-friendly display you’ll find in a Golf or Passat, while the multifunction steering wheel makes life a whole lot easier for communications and listening to music. The build quality is first rate – typically VW, and though the materials are hardwearing and durable there is a sense of that VW quality shining through. Business can be taken care of as you travel with the help of the new Discover Media system (optional). This system can easily navigate you to your next job and tell you about traffic jams or parking spots available beside your destination. App-Connect lets you access smartphone apps without even reaching for the Smartphone, and Car-Net is able to monitor your vehicle’s engine and mechanical parts through the optional Security and Service function. The Discovery Media system is well worth the outlay. 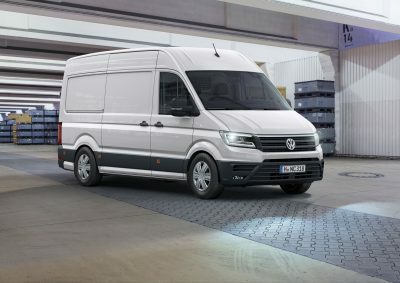 With this sort of technology available, the 2018 Volkswagen Crafter Van really is a benchmark. There are cup holders for occupants, and a shelf that sits underneath the dash for storing invoice books, pens, phones and other paraphernalia. Again, on the top of the dash, are areas for storing bits and pieces – if required. The cabin also features storage compartments for sunglasses, a torch, folders, gloves and loads more. USB connection ports are housed in the dash – perfect for connecting the laptop or smartphone. And, you’ll also find a 12-volt power supply for device charging. The central passenger seat can be folded down to create a desk for you to write out invoices, tap on the laptop, or even to seat your lunchbox if the weather outside is not cooperating. If your line of work means that the centre seat in the front is not needed, then Volkswagen has an option for you to only have two seats up front. In this form you can access the rear between the front seats. When most of your time at work is spent driving between destinations, it surely must be important to have a safe van as a travelling companion. Volkswagen’s latest Crafter is kitted out with premium safety features boasting Side Protection, Park Assist, Blind Spot Monitoring with rear traffic alert, and other leading-edge driver assistance systems. Available as a standard Crafter safety feature, the Front Assist system uses radar to monitor your distance from the traffic in front, alerting you if you are too close. If you are following far too close to the vehicle ahead of you, Emergency Braking reduces the chance of a collision by triggering emergency braking when it detects critical distances. This has to be one of my favourite current safety features on any modern vehicle. Brand new 2018 Volkswagen Crafter Vans also offer some other amazing safety features which include: Crosswind Assist, Trailer Assist and Lane Keeping Assist. Volkswagen suggests there are 59 different ways to configure the new VW Crafter van. Differing setups include: different wheelbases, a range of roof heights, at least two engine options, door placements, Gross Vehicle Mass upgrades and styles, cab chassis or van body style, and much more. With the new Crafter Van available for purchase in Australia, you’ll be able to create the perfect van for your business requirements. Massive wide sliding doors that open up to 1311 mm, a high load compartment height of up to 2196 mm and a loading sill which can be lowered by 100 mm makes for superior functionality. The 2018 Crafter is designed with space for shelving systems and is available with an optional universal floor for even more flexibility. There is a wide range of payloads on offer from 735 kg to 1454 kg. There are up to 14 lashing rings recessed into the floor, lashing rails on all of the walls and an interior roof rack so that you can secure your cargo on-board for the journey ahead. A new VW Crafter Double Cab is a great choice for anyone needing crew transport as well as load carrying ability. Base Volkswagen Crafter Panel vans offer the Startline package that features things like: Front Assist, City Emergency Braking (without Adaptive Cruise Control), a Driver alert system, Cross wind Assist, a dual passenger seat in the cab with a folding back rest and under seat storage, and mobile phone interface. 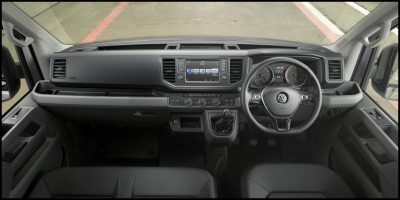 The Crafter Panel van Trendline adds Composition Media including DAB+ with an 8-inch touch-screen, a Comfort single driver’s seat, a multifunction steering wheel, a multi-function display on-board computer and cruise control with a speed limiter. The Crafter Panel van Highline boasts features like a heated windscreen, a Comfort plus single driver’s seat, parking sensors – front and rear, and front fog lights with a cornering function. On the road, the new Volkswagen Crafter Van feels large, safe and balanced. There is plenty of stopping power to back up the torquey turbo-diesel power plants. Volkswagen has designed the Crafter’s TDI engines specifically for commercial vehicles and their high demands. A 103 kW 2.0-litre TDI with 340 Nm of torque from 1600 rpm is a smooth performer that can offer fuel economy with an 8 litre/100 km average. A more powerful 2.0-litre TDI engine comes with 130 kW at 3600 rpm and 410 Nm of torque from 1500 rpm. The VW TDI engines are renowned for their reliability and efficiency, and for 2018 there is even an 8-speed automatic gearbox option. The 6-speed manual gearbox is robust and reliable, combining with three different drive systems; front-wheel drive, rear-wheel drive or 4MOTION all-wheel drive. Keep your business looking modern and accomplished with the acquisition of a new Volkswagen Crafter Van. For any more information on the new Volkswagen Crafter Van models or, for that matter, any other new car, contact one of our friendly consultants on 1300 303 181. If you’d like some fleet discount pricing (yes even for private buyers! ), we can submit vehicle quote requests out to our national network of VW dealers and come back with pricing within 24 hours. Private Fleet – car buying made easy!